My mother’s recipe note book hides a lot of treasures. 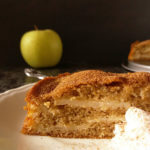 This Simple Greek Apple Cake is really easy, frugal and tasty one. Since the ingredients do not have anything to do with typical Greek flavours I asked her how it become a Greek one. And, of course, there is a story behind: my parents have friends of Greek origin, living close to their house. They have two children and we spent quite a lot of time playing together when growing up. Their ancestors run over here in 1941. to save their lives after two years of terror in their home land. There was a war between Italians and Greeks and the things got more and more complicated and were one of the triggers to Second World War horrors. We know It is a part of history that no one should be proud of: widow with three sons arrived and did her best to survive. So, Greek widow was very creative woman using every single resource and was capable of creating tasty dessert out of one apple, few eggs and a handful of flour. 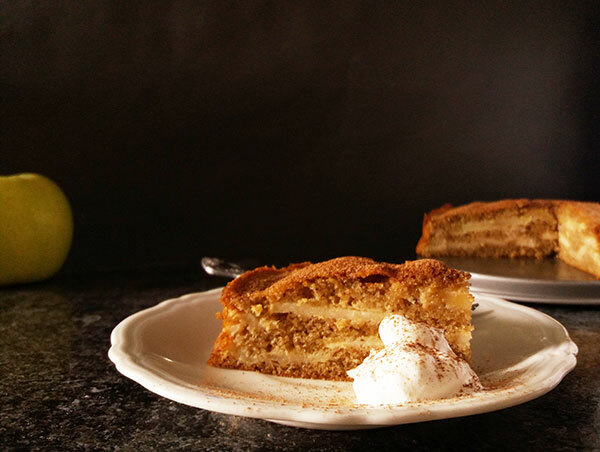 My mother has written down this simple beautiful one and named it Simple Greek Apple Cake. Grease rounded 7 inches baking dish. Whisk egg whites with pinch of salt in a medium sized bowl, until stiff peaks form. Slowly adding and combining with spatula, add sugar, butter, egg yolks, milk, flour, baking powder, vanilla extract and cocoa powder. Pour approximately 1/3 of batter into a dish and gently lay apple slices all over, cover with 1/3 of batter and lay the remaining apples again. Cover with remaining batter and bake for 26 minutes. Test if baked by inserting a skewer into the center. It should slide easily through the apples in the middle and come out clean. Cool. Sprinkle with cocoa powder before serving. Serve with whipping cream, if desired. 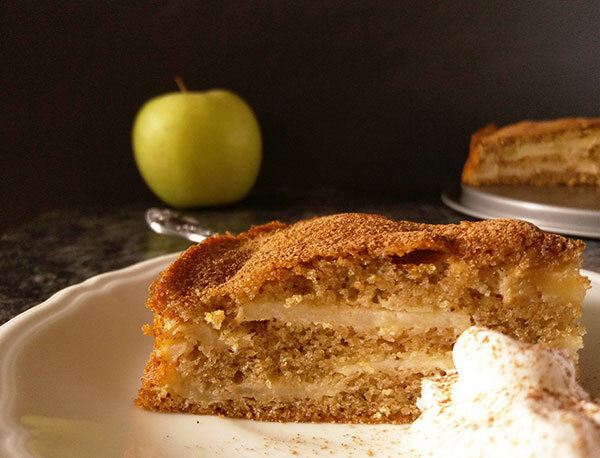 24 Responses to "Simple Greek Apple Cake"
It looks delicious dusted with cocoa! So pretty, and you can never go wrong with an apple cake! 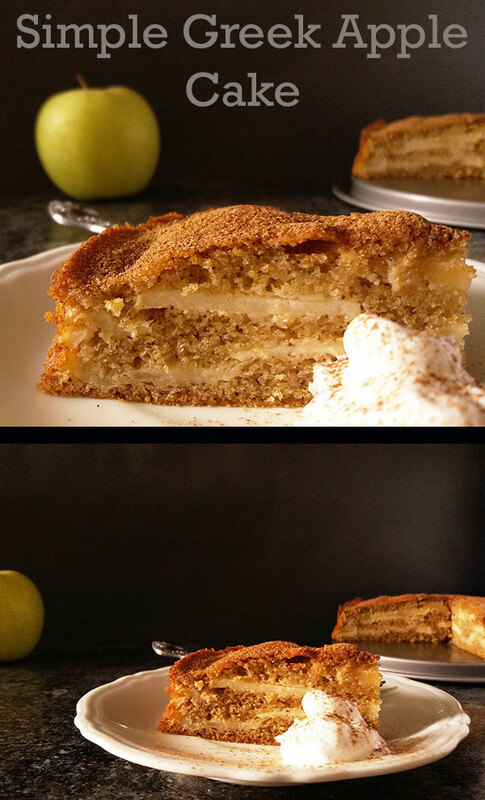 I love apple cake and your version looks spectacular with the layers! You are so kind Roz 🙂 Thank you so much ! Such a lovely cake and so pretty! Simple cakes like these are definitely my favorites! Oh yes dear Kelly; simple is the best 🙂 Thank you so much for coming ! I love finding recipe treasures in my mom’s notebooks. Lucky your parents had this talented Greek baker friend. The cake looks and sounds fantastic. Thank you Valentina; agree completely: such treasures are worth of showing to the world: simple and evergreen. Appreciate your comment. It’s amazing what people can achieve during famine and wartime. I can’t even imagine what people in Europe were going through during WWI and WWII. Thankful to have been born during another time. This cake is amazing! I love the way the apple are used a layers rather than blended into the batter. Thanks for sharing this recipe! Thank you MJ ! Bad times seem to show the best people ( women, especially ) hide inside ! Simple, easy, frugal, tasty : worth of making ! Thanks dear Kim ! I love apple cake and this looks absolutely easy and delicious 🙂 The layers look so beautiful too. Thank’s mom for writing down this recipe so 2pots could post it. I love simple cakes like this and we look forward to trying it. The teaspoon of cocoa powder is intriguing, can you actually taste chocolate in the cake or is it more for color? Thank you Ron ! Cocoa is not giving any special chocolate flavour. It’s just the colour. Hope you will enjoy this simple and frugal beauty ! I love these simple cake recipes! They are perfect for those days you just want something sweet that isn’t a big process to make. Don’t get me wrong, I love the big desserts, too, but this one looks and sounds so satisfying! A great story comes with it, too! I love it! Thank you! Thank you so much Laura; agree completely : big, loaded desserts are great but these simple ones are quick to do and taste great. Sad story, but fantastic recipe. One look and I was hooked. I love apple cakes, but I’ve never had one quite like this. So glad you discovered new apple cake at my place 🙂 I am sure you will like this one ! Thank you ! Wow ! So happy to read that. Thank you !